With the intention of making the ultimately versatile carving board we give you “The Wedgie”. With a wedged nose and tail for tighter turns and a dropped platform for stability it has got you covered for commuting, freeriding, sliding, carving. You name it! im new to longboard and want to by a bord for cruising and transport, and i was wondering what board would be best for me, this or “the lowrider? The biggest differences in our opinion is that the Wedgie has a slightly softer feel compared to The Lowrider. The wedged angles enlarges the turning radius, giving you “longer” turns and it rides differently backwards as opposed to the “twin” shape of The Lowrider which behaves the same both forwards and backwards. Im new in longboard and i have just oder a Slipstream The wedgie. People have complain that the quality is bad and it often brokes. They also say that the screw holes are wrong. Now i just wounder if it is so bad as it sounds, I dont hope so but i just want to know, is it no the perfekt quality? 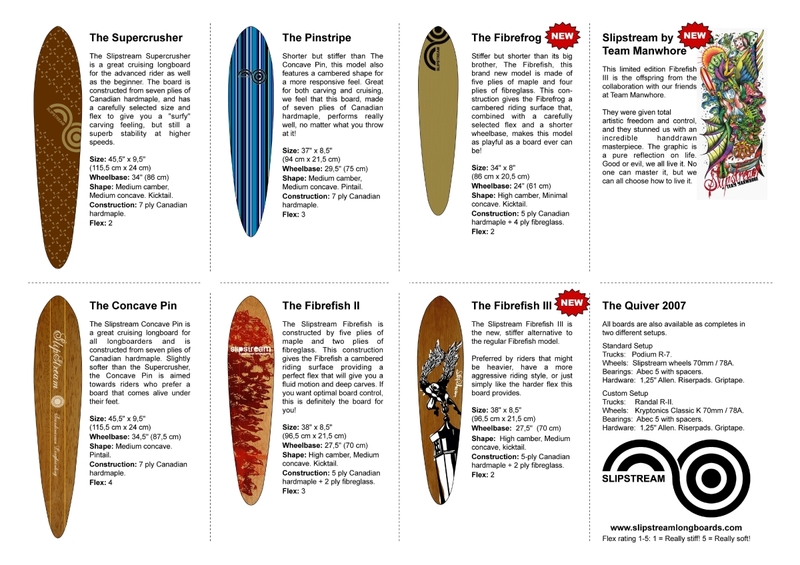 This is a new model for 2011 and we have had ZERO complaints, no returns and no broken boards this far. Regarding mounting holes they are perfectly aligned (this is done by machine). We have heard of problems with defect/crooked Randal baseplates that have given the impression that the boards holes are off, but that has not been the case when compared to other brand baseplates. Hi Dhracer and thanks for the comment! Why does this board resemble the board you mention/why does the board you mention look like this one? Why do some boards look like other boards? The main reason is probably that boards like these (there are several others out there!) perform really well and are appreciated by a lot of different riders. hey I’m 13 years old and going to buy a new longboard and I’ve decided the wedige 2011 or the 2011 lowrider which of them is the best for me. I’ll crus, and go in the hills, and go in town, and use it as a means of transport. which should I choose? Conclusion: If you prefer Stiffer flex and sharper turns, go for The Lowrider. If you prefer a softer flex and bigger turns, go for The Wedgie! 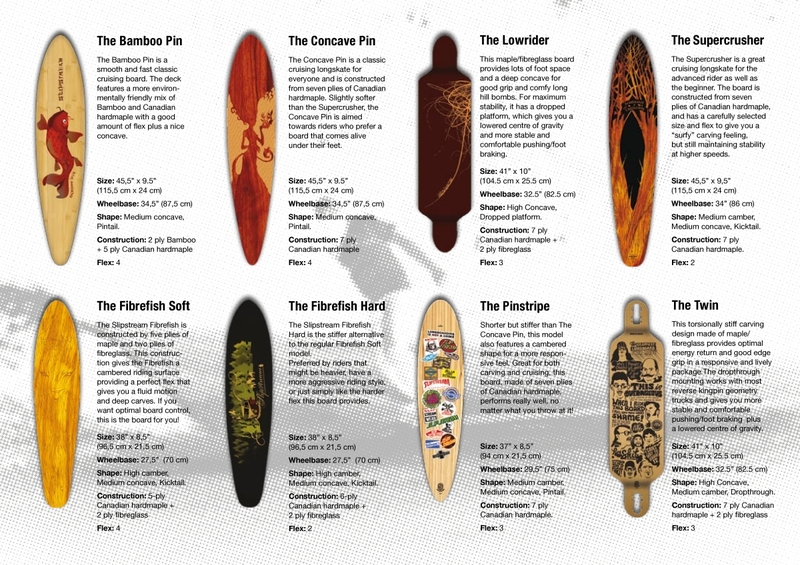 I’m new in longboard and i i want an “all around ” longboard. This board is the current favourite at the demos among beginners, so it will probably be a good starting point for you. As always; If possible, try different boards to see what your preferences are. I’m about to buy my first board. I’ve tried my friends board for almost a week now and I’d say that I’m pretty good at it, not much of a beginner any more. The thing is that I don’t know anything about boards. I’m only going to use the board for transportation, not to play around. I like to be able to cruise around just chillin’ on a smooth board! I’m bout 185cm and 70kg, any suggestions? I’m thinking The Supercrusher or The Wedgie maybe, but I don’t really know anything. You should probably go for this one or The Lowrider. Perfect commuters and great for cruising and really effortless to ride. Thanks for the advice and a very fast reply! I’m just wondering how the lowrider will perform at higher speeds, I live in an area with some pretty steep slopes, will it still be stable? The Lowrider flexes less than The Wedgie, so it will probably be the more stable of the two. HEY: When will the 2012 colection be dropped ? The 2012 Collection should be available in stores March 2012. Jag väger cirka 40 kilo och är 157cm lång. Passar den här brädan för mig? This will be a pretty big board for you, but if you are a beginner or into commuting it should work out fine! I’m getting a new board but i’m torn between the wedgie and the twin! I tried a 2009 the twin the other day and loved it, but i think the wedgie looks like fun aswell! Are there any major differences? like turn radius or so? These boards are pretty different in our opinion. You should definitely try the Wedgie as well if you get the chance, The 2011 Twin is a little bit shorter and stiffer compared to the 2009 Twin. Thank you for pointing that out, you are correct. We need to get that sorted out as soon as possible, thanks again! Hej, jag funderar på att köpa en longboard, fick nämligen pröva min kusins igår och den va skön att åka på. Där truckarna satt fast var det högre och “stå ytan” var lägre. Vad kostar en sån ungefär? Please contact your local dealer for current pricing (see section above “dealers”). Hi, and i wonder how i can me sponsored by Slipstream? Thanks :) i ride alot of longboard on my sparetime! Hi Anton! I wrote to you about sponsorship via e-mail! A friend of mine is going to buy a longboard. I have The Twin and is very satified with it. He wants either The Lowrider og The Wedgie. He is going use it for cruising and maybe sliding after some time. He weighs 80kg and wants a board that is not to stiff and flexes. Which board should he choose? 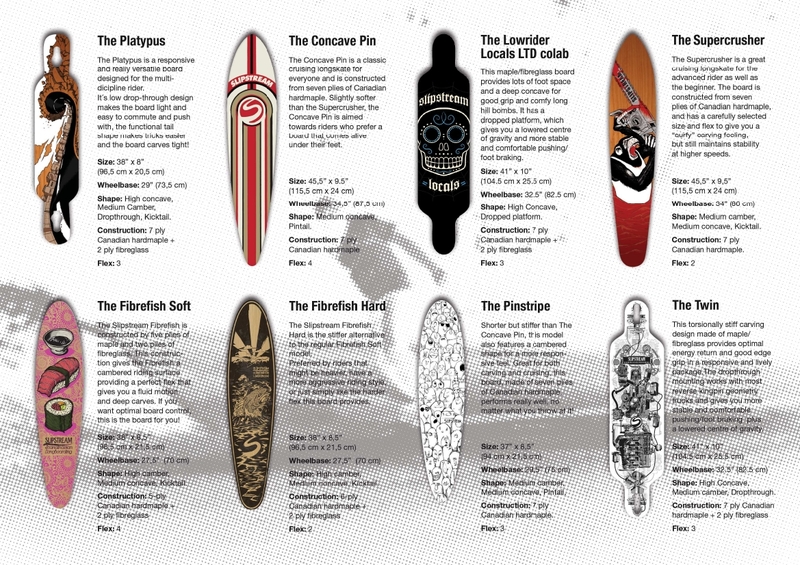 Both boards you suggest flex more than The Twin, but between those two, we would go for The Lowrider for your friend. I’m looking forward to buy my first longboard and i prefer the wedgie. My question: is it good for beginners? I would like to cruise/carve some hills and after skilling some basics i would try to learn (stand-up)slides and go for freeriding. Is this the right board for me (190 cm, 85 kg)? Actually, this board get the most love of all our boards from beginners at demos. Cruises and carves like a dream! You should probably also consider “The Lowrider”. A tad bit stiffer in the flex and a good sliding board as well. I am looking at Wedgie or Lowrider but I weight 115 kilos . Which is good for my weight If any? Both works with 115 kg but I would go with the Lowrider. It’s a little bit stiffer + higher so it’s harder to get rail baits. I’m wondering how much the board itself weights, i have one of these boards, and I am very pleased with it. Hi Kalle, glad you like your 2011 Wedgie! We are sold out on that one, but the 2012 Wedgie with griptape weighs in at just under 2.1 kgs.